Squeegee | Product Information | MURAKAMI CO., LTD. 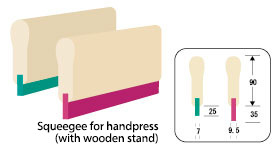 The selection of the squeegee is crucial in order to obtain good printing results. At Murakami, we handle a wide variety of squeegees so that we are able to make proposals that are optimally customized to our customers’ printing conditions and applications. This is an ultra solvent-proof type for UV ink and general solvents. Compared to the conventional polyurethane and silicon squeegees, this type has several times more durability in the process in which polyimide paste is used.